We know how to get KTMs working butter smooth, making your tires feel glued to the ground and getting your KTM to turn like never before. The WP suspension performance on KTMs can vary from year to year and model to model, often being too harsh (hacky feeling) in the early to mid portion of the stroke, yet can bottom too easily at the end of the stroke. There is often too much front wheel deflection, and the front end can push wide coming into turns then wants to stand up under throttle. We fix all that and more. We are located on a 1000 acre riding facility (www.HighlandParkResort.com) so we can make suspension changes then go right out the garage door and test. No waiing for the weekend or realying on others to report back days or weeks later. We do lots and lots of testing, more than anyone else. We also have a in house suspension dyno for testing damping changes in forks, shocks, and also testing spring rates. All our testing has allowed us to develop specific valve stacks and other internal changes that are tailored to your particular bike, your weight, height, riding style, current skill level, and terrain. What we do with suspension REALLY WORKS. Many other places that do suspension will either shuffle a few of your valve shims around, and/or take out one or two shims, trying to achieve some suspension compliance, but almost always this make things too soft. When your suspension is too soft, it only feels good on the small stuff but then falls through the stroke and becomes harsh on the bigger stuff or when you try to pick up your pace. This kind of compromised suspension teaches you to ride at a certain pace, not any faster, because going faster means the suspension begins to punish you and the bike begins to get uncontrollable. You need suspension that is compliant and plush on the small to medium hits, but will take the bigger hits when you pick up your pace. 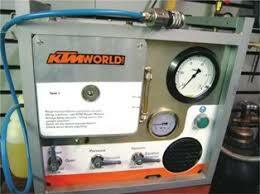 KTM World has well over 10,000 valve shims IN STOCK to do your suspension right. We also use a factory WP suspension pump to vacuum out all air left after a shock has been taken apart. We do suspension that is plush but holds the bike up in the stroke where it needs to be for compliance on smaller hits, and still takes the bigger hits. We only do KTMs, and we have developed the best KTM/WP suspension Send us your suspension for revalving or routine maintenance, you won't be disappointed, we guarantee it 100%. 1. Ship us your forks and shock, we do the work and ship them back with clickers preset to known good settings, very little dial in required. Call us 7 days a week - even from the track - if you need help. 2. Ship us your forks and shock, we do the work, then come visit us with your bike in your truck/trailer, we bolt on the suspension, test ride and adjust clicker settings for you, then you ride at Highland Park for the day (or longer) and we help you dial it in until you are 100% happy. 3. Bring the bike drop it off, we do the work, you come back and ride at Highland Park for the day (or longer) and we help you dial it in until you are 100% happy. Includes top quality synthetic oil, all shims, nitrogen, and labor. Seals, o-rings,bushings and other wear parts may need replacing and these parts are extra, but there is no extra labor to replace them while we are doing a full service and revlave. Price includes all labor to disassemble, make any repairs that might be needed, and chrage with nitrogen. We use top quality thermally stable synthetic oil. Parts needed like oil, seals, bushings or other wear parts are extra, but there is no extra labor to replace wear parts while we are doing a full service. Includes top quality synthetic oil, all shims, nitrogen, and labor. Seals, bushings and other wear parts may need replacing and these parts are extra, but there is no extra labor to replace them in a revalve & service. WE CAN LOWER YOUR SUSPENSION! We make our own internal lowering parts to correctly lower your bikes ride height. These parts may be removed at any time to restore the original ride height. Please call us about how much you should lower your bike. Revalving is reqiured when lowering shocks and forks, so there is not a lot of additional cost to lower at the same time. WP Shock Pump - the only way to correctly remove air from your shock after a service or revalve.